Do you ever look back on your style, be it fashion or design, and ask yourself "What was I thinking? Did I really think that was cute?" I know I do! In honor of my 5 year anniversary from graduating college, I thought I'd take a walk down memory lane and check out my college apartment. The good, the bad and the ugly. This apartment, most commonly referred to as the A.P.T. by us and our friends, belonged to myself and my best friend Lauren. Before you see the pictures, I must tell you not to judge. We tried. Really hard. First stop--the living room. The side tables, coffee table and lamps were all thrift store finds. The tables received a coat of paint and a little distressing and the lamps were outfitted with new shades. I found the chandelier at Kirkland's Home for $15. This room didn't have a fan or light fixture, so we felt we needed a little something something hanging from the ceiling. I still have it (stored in our sunroom) and hope to use it again one day. (I'm still a sucker for crystals and chandeliers). It also went with me to my first place in Dallas. I've definitely gotten my money's worth out of it! We decided to go with a crimson, gold and black color scheme. After all, we did attend the University of Alabama (home of The Crimson Tide!). I won't even tell you how long it took to measure out and paint those stupid stripes (we used a regular 18" ruler to measure out each line--insanity). 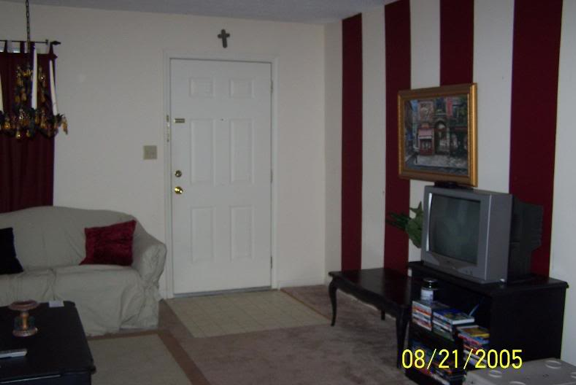 I would never even think about putting crimson stripes in my home today. Like I said, tastes definitely change. 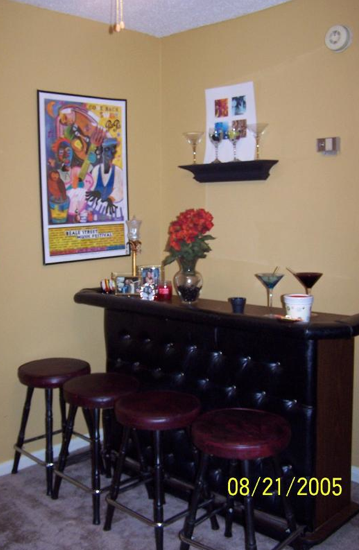 This bar was the rock star of our apartment. It actually belonged to my dad in his bachelor days in the 70's. I thought it was so cool that I insisted on cleaning it up, installing a new wooden base (the old one had rotted) and using it in our apartment. It was more for show and storage than anything else. In fact, instead of using it to hold liquor, we hid our vacuum on one of the shelves behind it--no joke. It definitely made a great conversation piece. The stools were given to me by a friend of mine whose parents were going to toss them. 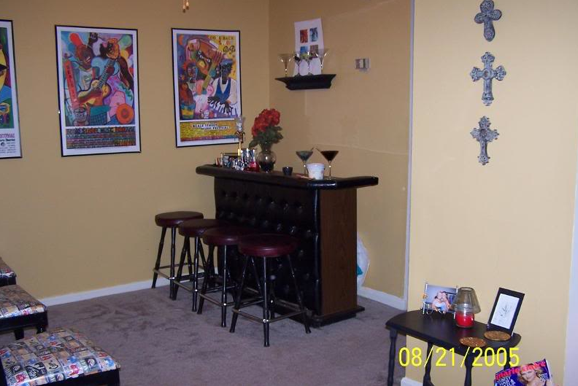 Another view of our dining room/bar area. We didn't have the table in there at the time of this picture. We painted these walls too. Although, I actually still like this color, unlike the crimson. And here is my beloved bedroom! 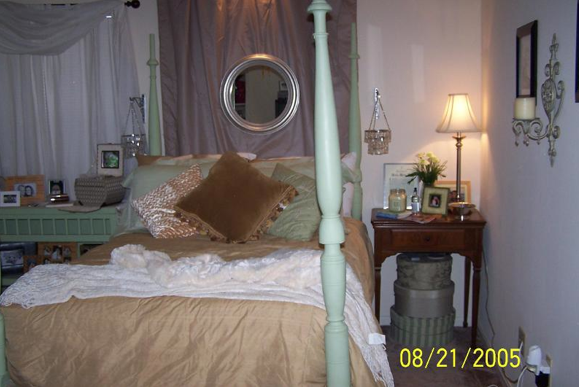 This room is far too frou frou and girly for my current tastes, but oh how I loved it then. 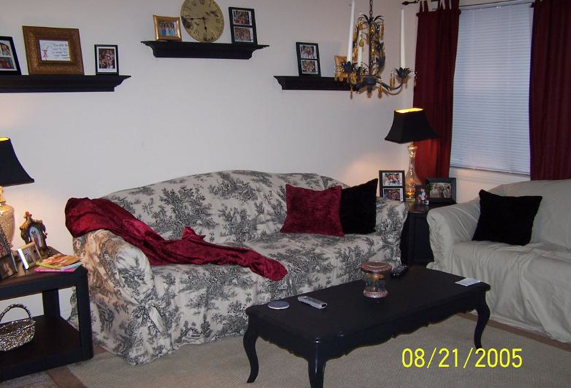 I don't think it was too bad considering every furniture piece was either from the thrift store or a hand-me-down. Lots of hours were spent slaving away with that green paint. 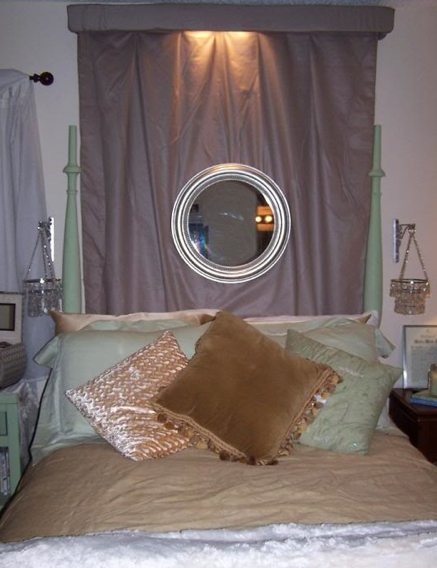 The mirror over the bed currently hangs in my master bedroom and the dupioni silk duvet has been with me ever since (I used it in Dallas and now in our guest room-great buy). Another view of my bedroom room. 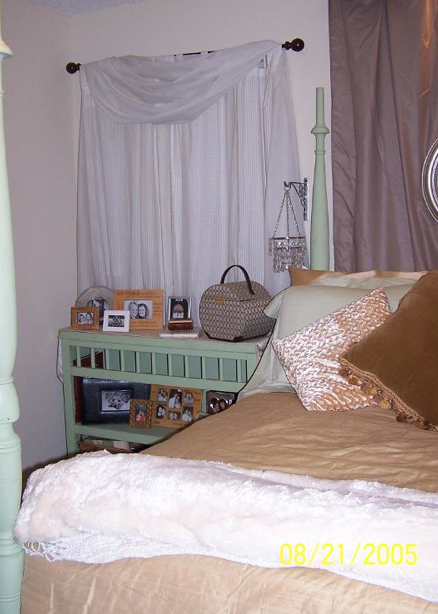 The bed was an antique that was given to my mom from my grandfather. 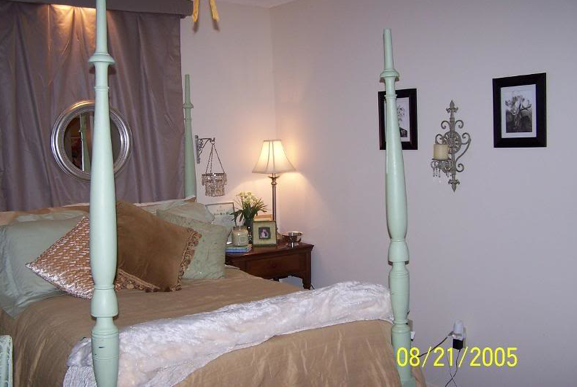 It was previously painted a dark teal. After college, it went back to my mom's and was restored to its former teal glory (make sure you use the right paint when painting over oil-based paints). My mom and I made this lit up cornice board. I saw the idea on Christopher Lowell back in the day (anyone else remember that show?) and HAD to make one of my own! This too moved with me when I went to Dallas. It's amazing what a little fabric, 2 x 4s and a strip of under cabinet lighting can get you. I'm sad to say Mr. Cornice didn't get to make the move to Oklahoma. RIP Mr. Cornice. I can't stand draping windows curtains. I'm not sure what I was thinking there, but I do remember the set all coming together, and it being a good deal. The bookcase was another thrift store find (it used to be the top piece of a dresser). I coated it with the green paint and threw in some books and frames. It did the job was the perfect size for the space too. I think it cost $10. 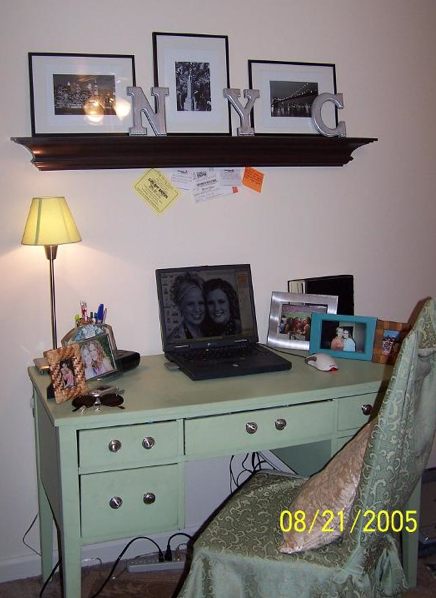 And last but not least, here's the place where all of my papers and projects were written. This desk was also a thrift store find. A little paint and some new knobs seemed to do the trick. I repainted it black and moved it with me to Dallas later on. The NYC pictures were ones I found online and printed out on photo paper, and the wooden letters were $1 each from Hobby Lobby that got a coat of silver paint. I loved New York City and wanted to move there after graduation and work at a fancy schmancy ad agency. The chair cover was a $10 find from Old Time Pottery. It covered a beautiful antique chair that I still have in my home today, sans that tacky chair cover. Again, what was I thinking? So that's it. That's how I rolled in college. What do you think? Anything that sticks out or surprised you? Do you have any old school design confessions of your own you'd like to share?